Because of the peak season, we have had to move around a lot, but we still managed to find places to stay that won’t break the bank. These all came in under £25 per night, including breakfast. The Teuz B&B was our first stop for a night and close to the airport and around a 40 minute walk to the centre downhill. The rooms are clean with air conditioning, but there is no WiFi. 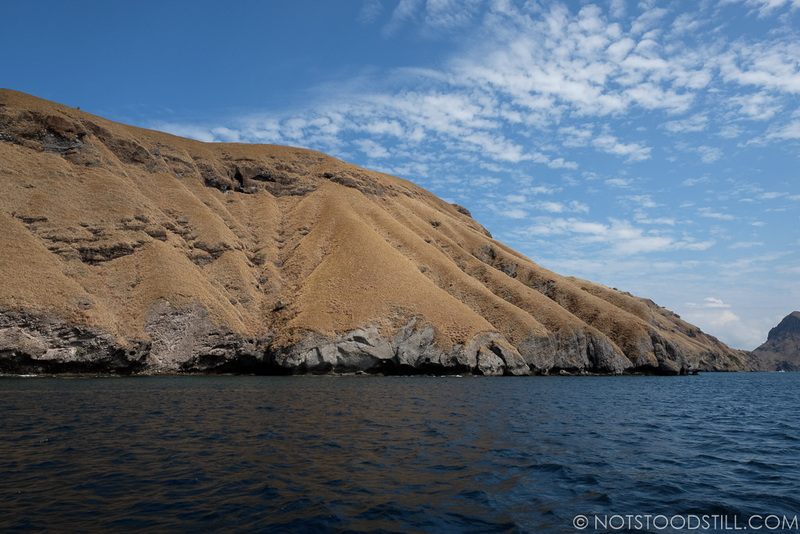 The area is quiet as there are only a few flights to Labuan Bajo a day, but you will hear the cockerels in the morning. Breakfast was ok here, but I think you’d be best ordering rice than the bread. Aulia Hotel is a little closer to town, has a good traditional breakfast and WiFi in the breakfast area. Rooms have air conditioning and manual flush toilets. There is also a good convenience shop next door and the centre is about a 20 minute walk away, also downhill. Hotel Kasuari is a similar distance from town as Aulia and also has places to eat and a few shops nearby. Rooms are quite large, with air conditioning again, and WiFi in the communal area. If you are wanting somewhere more upmarket, check out Molas Cafe. It’s a lovely complex with a pool, western and Indonesian dishes and good WiFi. Service is great here, but it is definitely more expensive with dishes starting at 45,000 (plus 11% tax) and drinks from 25,000 (plus 11% tax). There is also a burger bar Burger Time, who deliver and can be contacted through WhatsApp, which is great if you can’t face leaving your air con room. They also offer fried or roasted chicken – another must try! 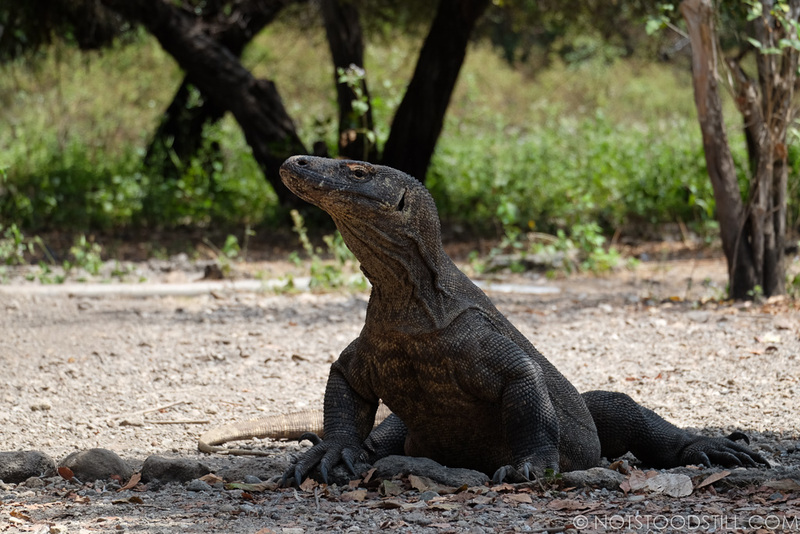 The main attraction here is definitely the Komodo dragons and the main road is filled with agencies to help you organise this. Keen divers also have a good choice of spots in beautifully clear water. 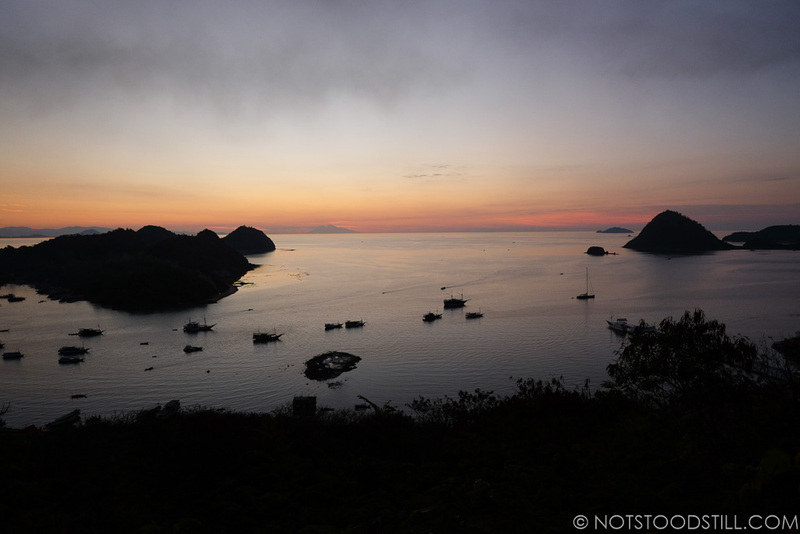 We originally thought about taking an overnight boat trip to see the main sights around the islands in the bay, but we struggled with finding a cabin. If you are fine with sleeping on deck, you won’t have a problem in the peak season, but it is best to prebook something if you do want that private space. We eventually decided to go for the day trip, which meant a very early start at 5.20am, but it takes in the same sights, albeit with less time in each, in around 12 hours. 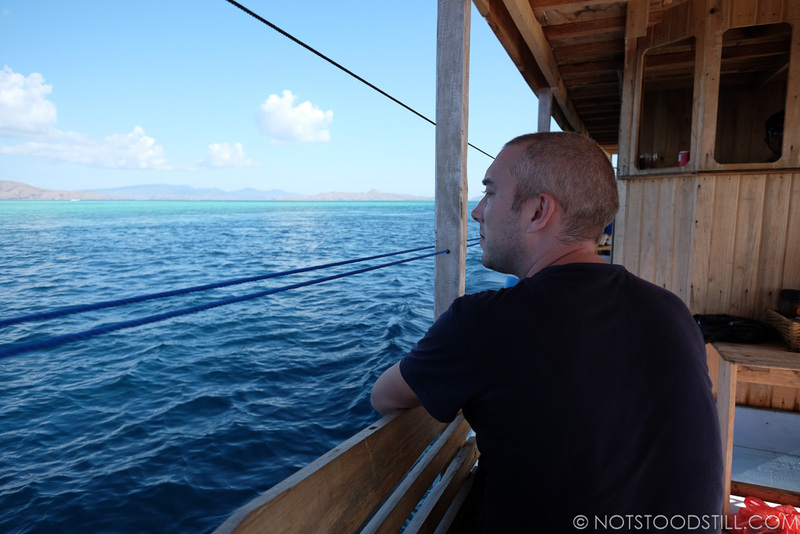 We booked with Wanua and the day trip cost 500,000 rupiah each (compared to 1.5 million each for the overnight cabin) and included lunch, snorkels, fins and water. The boat was comfortable enough with benches and space on the deck for sunbathing during the long sailing times. There was also a toilet on board. 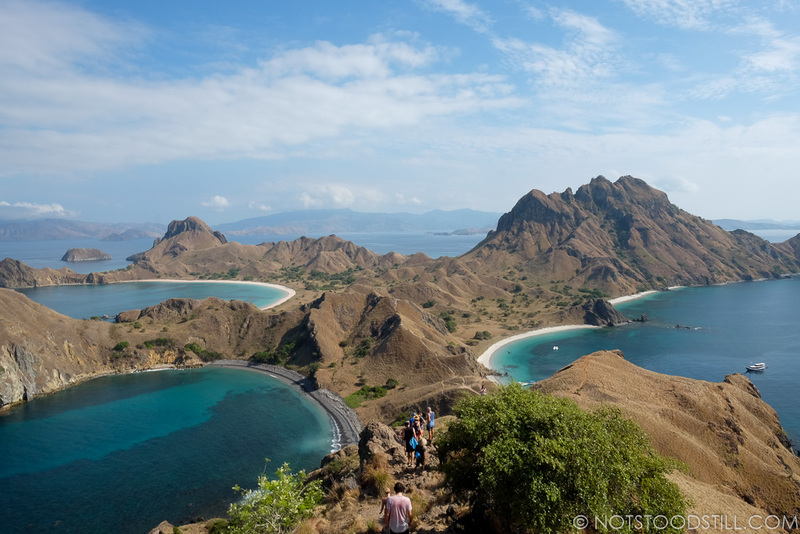 Many of the islands in the Komodo National Park are uninhibited by humans and retain their striking landscape. 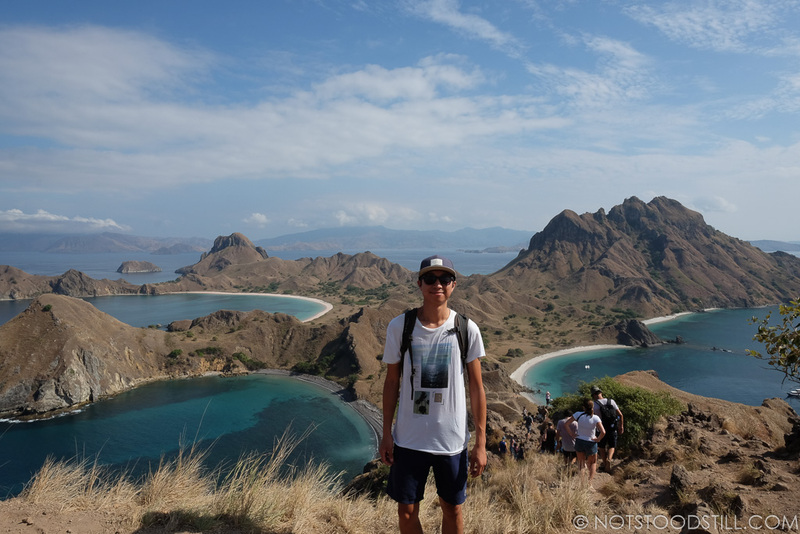 The first stop was Padar to try an recreate the infamous two beach photograph. If you want to climb the 500m to the summit, we would recommend you bring trainers. We did manage it in flip flops, but the track is narrow, busy and quite slippery in places. 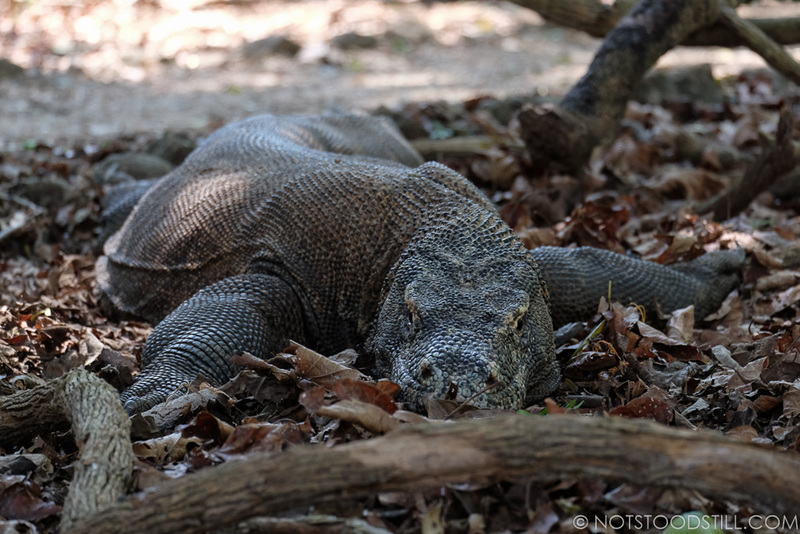 The next stop was Komodo Island, home of the Komodo Dragon. You can actually go to a closer island called Rinca which gives higher chances of seeing these huge creatures if you don’t want to travel so far. 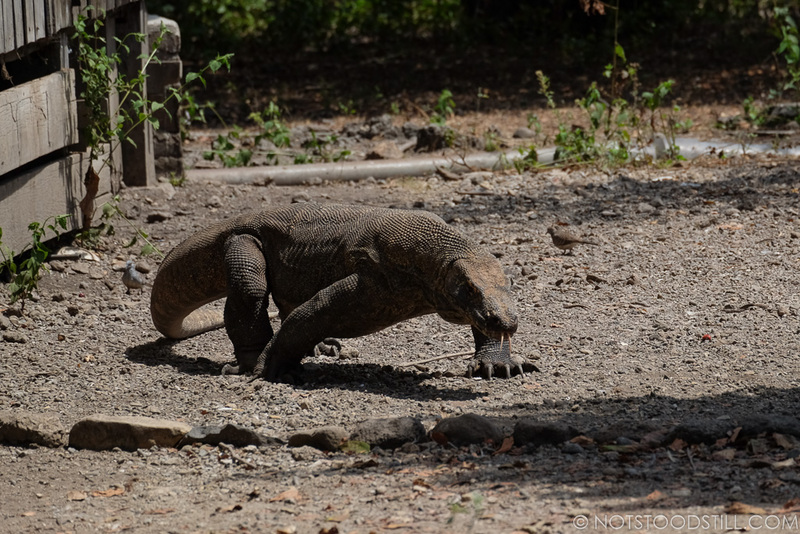 On arrival at Komodo, you have to pay the entry fee and ranger fee. 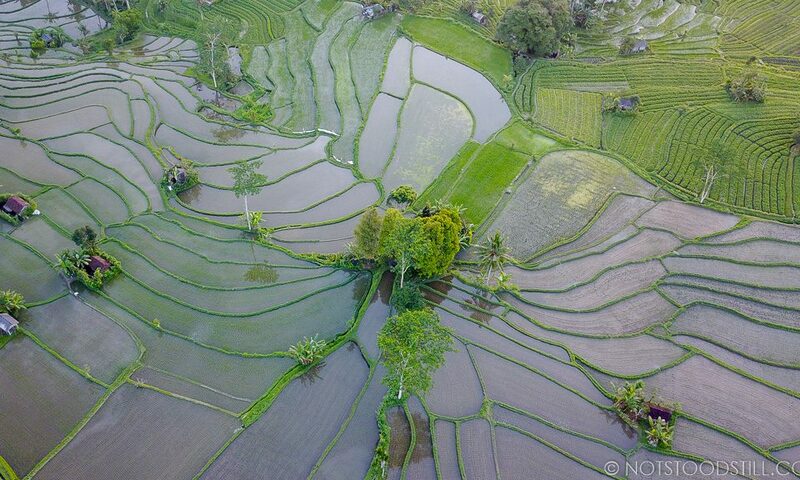 The entry is 250,000 rupiah per person and the ranger is 80,000 per ranger. As we were a group of seven, we had two. We were very lucky and saw seven dragons on our 3km walk. The rangers are knowledgeable and give you safety advice when you arrive, but when you see these animals, you won’t want to get too close anyway! The dragons are free to roam, so you may not always see them and they are not domesticated. The rangers are armed, but only with forked sticks, so listen to their advice while on the move. After our enjoyable (and slightly scary) walk, we had a dip at Pink Beach where the cool sea was clear and refreshing, before heading to Manta Point. This was a long trip but we found mantas and quickly jumped in to swim with them. Mantas are very fast and at one point we re-boarded the boat to follow them. As a word of warning, Manta Point can have very changeable and strong currents. Listen to your captain and if you are told to return, move then. We saw several people ignore the warning and were almost hit by a boat while trying to get back on board. Our captain cut our time short here due to the currents – you can actually see them change from the boat. It was an absolutely fantastic, but tiring day – you will sleep well that night! 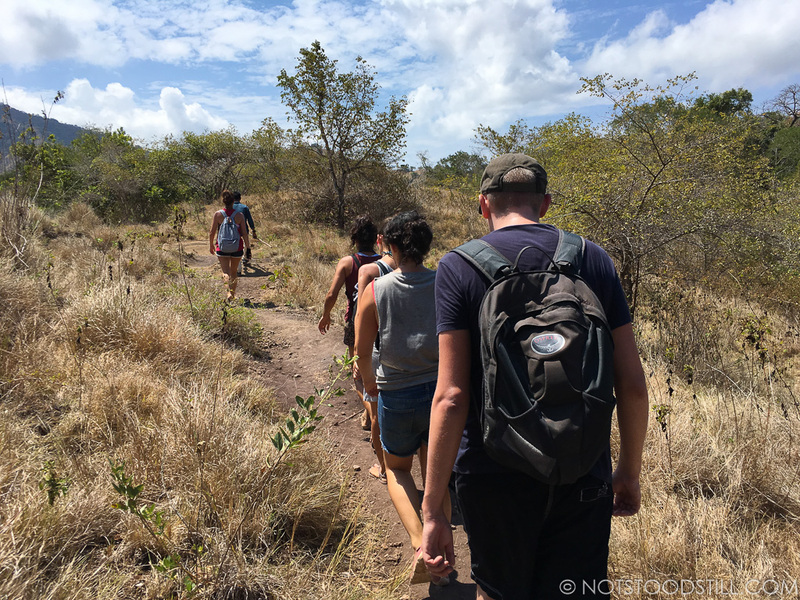 Labuan Bajo is a busy tourist town, so be extra careful when walking along the roads as traffic is heavy. 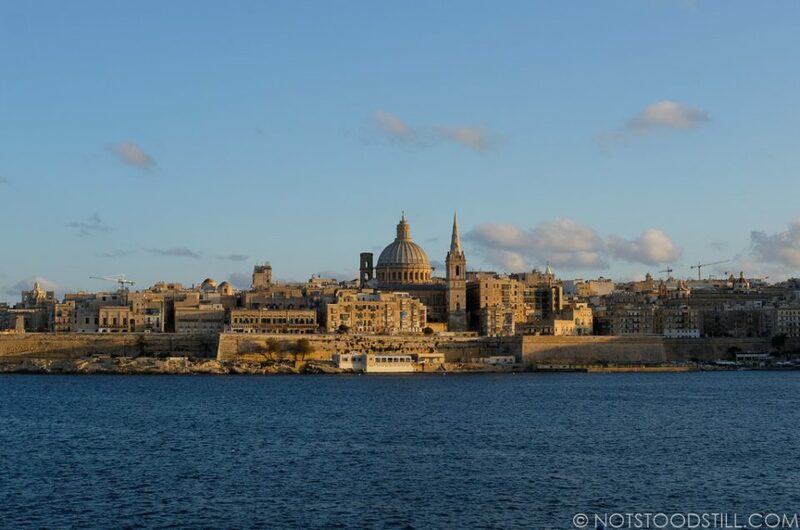 If you take a tour, listen to your guide as conditions can change rapidly. Take care whilst swimming in open ocean, especially within the island channels near Komodo. The currents can be very strong and dangerous. During high season, secure a hotel by booking in advance. 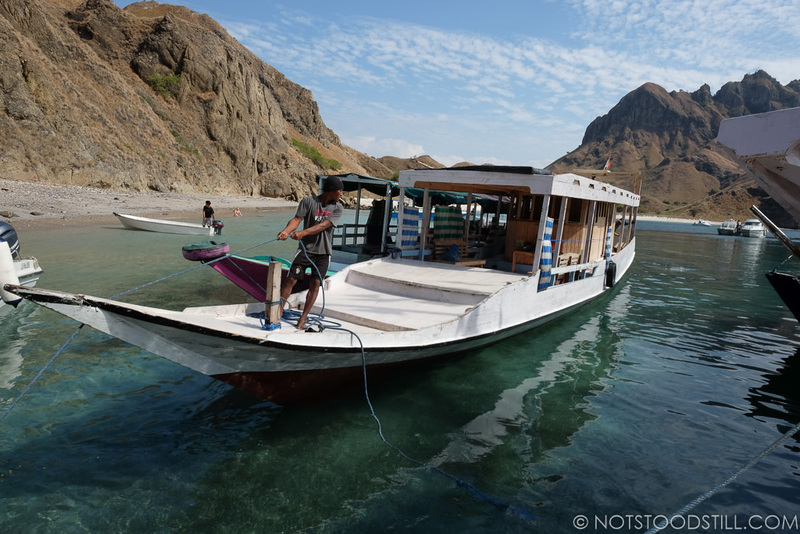 Komodo tours can usually be booked the day before in Labuan Bajo – even in high season (depending on the type of tour). 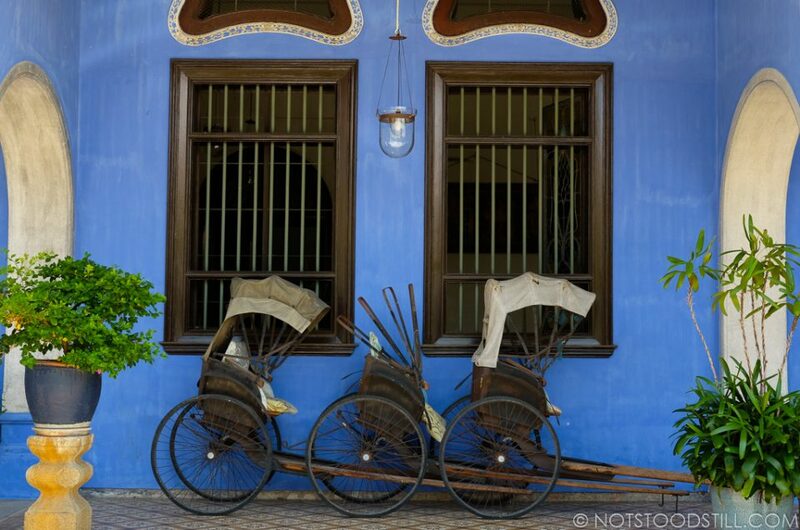 There are many vendors selling the same tours, do shop around for the best deal. Reconfirm all bookings, from hotels to tours as mistakes do happen and overbooking does occur. 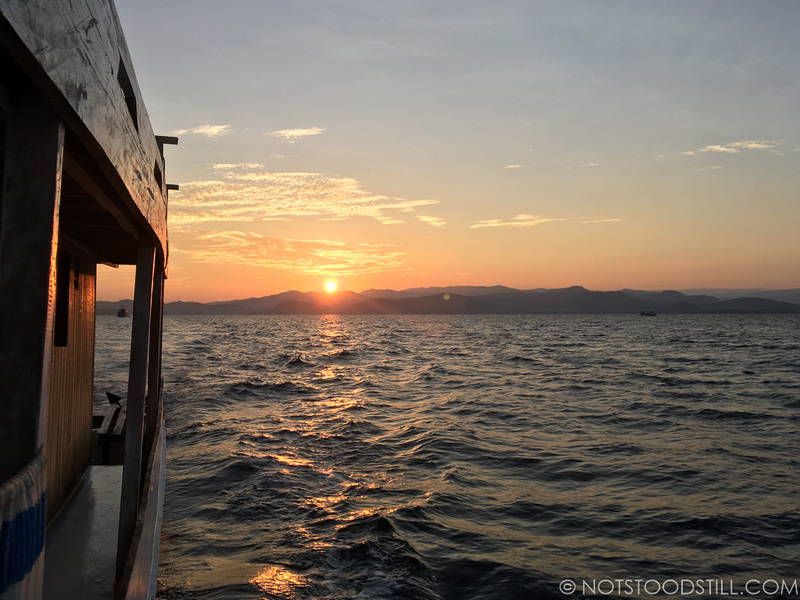 You can read our Flores trip from the start with Part 1 and Part 2.